Warning: If you have never worked with jewelry, particularly melting down jewelry and precious metals, then don’t use this article as your “qualifications” to begin now. Melting down jewelry takes skill for working with metals, and you should consult a professional, as well as the local ordinances and laws in your area, before attempting to melt down your own jewelry. We all know that the metals involved in jewelry are some of the most precious commodities on Earth – gold, silver, and platinum – not to mention the precious stones and gemstones involved in producing a beautiful article of jewelry. But not many of us are really sure about how this jewelry is obtained, assembled, and fashioned into the small rings on our fingers, or the necklaces hanging over our shoulders. Jewelry contains these precious commodities that can be melted down and re-fashioned into other things. With enough skill, equipment, and the rule of law on your side, you can become an expert in melting down jewelry; provided you are willing to do it safely and you are willing to work hard to get to that point. This article will get in-depth about the process, explaining what you need to know about melting down jewelry for its precious metals – gold, silver, and platinum – while also staying safe and not exceeding your legal limits. First, let’s explore what you need to know up-front about melting down jewelry. If you’re going to undertake this endeavor, be sure to check around and ask people who already melt down jewelry about their tips, pointers, and strategies. Talk to the local jeweler to see if there is anyone nearby who might be able to help you. It will help to ask them about the ins and outs of melting down jewelry – not just getting your information from an article, but actually seeing the equipment and the process actually happen, up-close and personal. Once you’ve done that, make sure you’ve taken note of all of the procedures, equipment, and safety measured involved in melting down your own jewelry. It helps to get an advanced perspective on it before you try it – this gives your mind a solid “image” of what successful melting down of jewelry looks like before you actually start melting it down. It seems obvious, but do you know that your source of heat is strong enough to melt down the three precious metals: gold, silver, and platinum? In order to melt down platinum, you’ll need a heat source that can reach 3,124 degrees Fahrenheit. 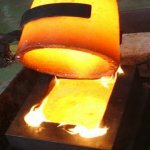 This is a strong enough heat source to melt all of the precious metals mentioned, since gold and silver have lower melting points. If you don’t plan on melting down platinum, know that gold has a melting point of 1,947.52 degrees Fahrenheit; silver’s melting point is 1763.2 degrees Fahrenheit. However, if you can melt down platinum, which has a high tolerance for heat, you can melt down gold and silver, as well. In order to melt these metals down, you’re going to need something that will contain the liquid forms of silver, gold, and platinum. This means finding a material hard and strong enough to hold it, as well as resistant enough to heat that it won’t melt under the extreme conditions needed to liquefy the precious metals. You’ll also need some way of manipulating the crucible, such as a pair of thongs for holding it or moving it. You’ll also need a heat-resistant material that you can use to simply and safely collect or wipe any excess liquefied metal that might have gotten on the crucible sides or lid. It cannot be stressed enough that this article is not what will make you qualified to melt down jewelry in your home – in reality, you’re going to need to do a lot more investigation on your own in order to see how it can be accomplished. But it can be emphasized that you need to acquire the proper safety equipment. Protect your face with goggles and a face shield, your hands with heat-resistant gloves, and wear a heavy apron. Also, please note: make sure not to melt down any jewelry near anything flammable. While this seems an obvious point, it needs to be mentioned because some people sometimes forget this simple rule. As mentioned earlier, be sure to consult others about melting down jewelry, equipment involved, and local ordinances and laws before pursuing it for yourself. Why is Platinum A Good Metal for Jewelry?